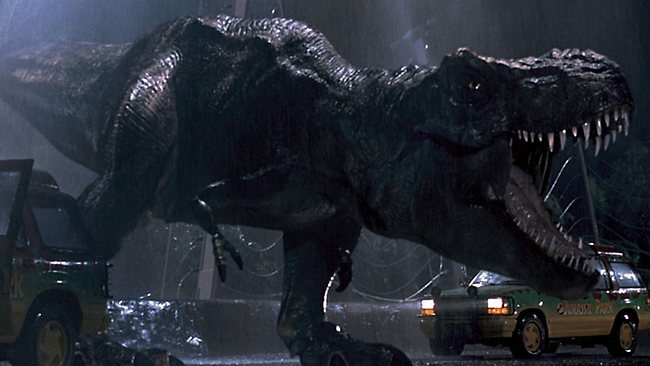 Jurassic Park 3D Blu-ray Review Newly released on 3D Blu-ray by the fine folks at Universal, Jurassic Park is the perfect vehicle for the 3D format and pretty much sets the benchmark for the medium. At any rate, the peak of the Jeffster’s career was undoubtedly 1993’s Jurassic Park. Directed by Steven Spielberg and showcasing pioneering use of computer generated imagery, the film transfixed those of us that were children at the time of its initial release and still stands as one of the landmarks of 20th century cinema. 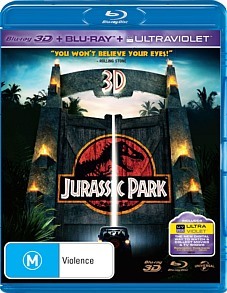 Newly released on 3D Blu-ray by the fine folks at Universal, Jurassic Park is the perfect vehicle for the 3D format and pretty much sets the benchmark for the medium. Superbly realistic effects and lavish visuals are bolstered by an updated 7.1 audio mix, and iconic scenes such as the pterodactyls in flight and the ‘raptor in the kitchen’ sequence take on a whole new life in 3D. For those not so equipped, this latest edition also features a 2D Blu-ray edition of the film, likewise presented in pristine anamorphic 16:9 widescreen with an all-new 7.1 surround soundtrack. And if that wasn’t enough, the set also includes access to Universal’s new Ultraviolet platform, which allows users to enter a redemption code online and then stream the movie from internet-connected devices such as iPhones and laptops. Laden down with several hours’ worth of bonus content in the form of numerous featurettes as well as exclusive looks into the film’s pre-production meetings, animatics and visual effects, this is an excellent and comprehensive set that proves a fitting celebration of the 20th anniversary of this iconic family favourite.